The Nissan Path :: View topic - ooops i did it again! Posted: Wed Feb 27, 2019 4:58 am Post subject: ooops i did it again! Had man flu last week, high temp and bored ! 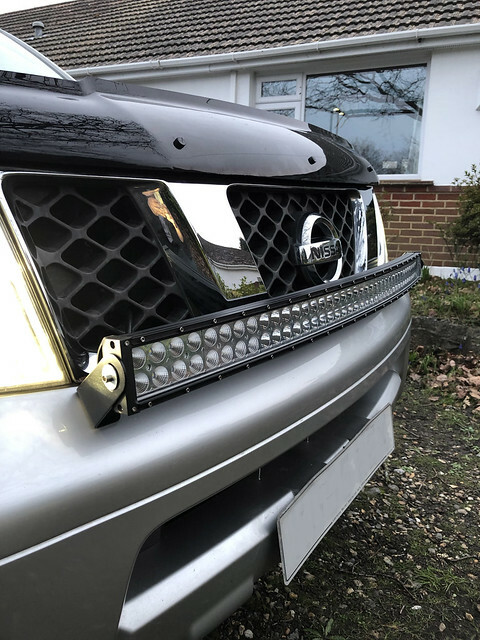 Ordered a new curved LED lightbar to replace my 20 inch one in the lower front grill...... Ordered a 42inch 360watt bar which came from Texas to the UK today..... Its bloody huge lol, i dont think my manflu temp realised how big 42inch is and possibly 32 would have been better. So now.. where to fix it !!! Probably on the front bumper in front of the main grill???? Dont really want it on the roof. Ideas? Any one else got a hooge one??? Took the old 20inch bar off today and replaced with this Phillips 42" curved. Also replace the end bolts for black with a decent washer and spring. That thing is like frigging daylight when it's ON! When I get some spare change I want to install the biggest one I can fit in that gape above the License plate! Thanks for sharing and awesome job mounting it!